Bees are such fascinating creatures that it’s a shame we can’t all spend our free time watching bees in our own hives on our roof tops, in our back yards or in under-used city spaces. Some cities (examples: New York, San Francisco, Los Angeles, Chicago, Austin, Washington D.C., Seattle and Portland in the U.S.A, Melbourn in Australia, Toronto and Vancouver in Canada, London, Kensington and Kent in England, Berlin in Germany, Kyoto in Japan, and Hong Kong in China) have been forward thinking in their urban food laws and allow beekeeping (with some restrictions) within the urban boundary1. Those of us in Ottawa Canada are not so fortunate as there are By-laws here which restrict keeping bees on anything but land zoned for agricultural livestock. Bee lovers in this town have to commute to spend time with our bees. I’ve spent a fair amount of time over the past 6 months forming relationships with people who have land in rural areas who would be willing to let me keep hives on their property. There is a surprising amount of land that is sitting idle within a 30 minute drive from the suburbs. When approached the majority of people are curious and friendly. The biggest surprise for me was accidentally tripping across a family owned construction company that owns HEAPS of land (mixed fields, brush and forest) who are willing to provide me access in exchange for a jar of honey every once and a while. The next steps will be figuring out what kind of hives to provide the bees. 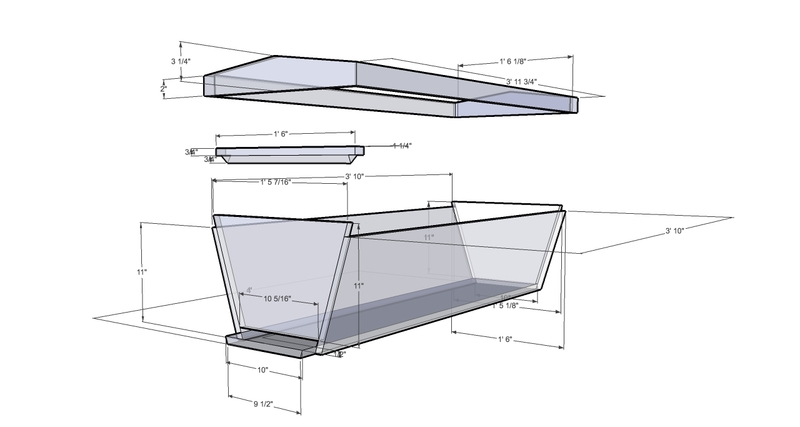 There are a dozen kinds of hives (that I know of) but two hive types seem worthy of serious consideration: The Langstroth hive and the Top Bar hive. All of the beekeepers I’ve worked with in the past have had the traditional Langstroth hive. The Langstroth was developed in 1851 by a guy named Lorenzo Langstroth2 and it’s a modular style hive which has boxes with a number of wooden frames with wax foundation on which the bees build comb to hold their young, honey and pollen stores. The deep box (or boxes in the case of double deep hives) on bottom where the brood (bee babies) are laid and raised and shallower boxes called “supers” are put on top as the bees need room to store extra honey. To harvest the honey supers are removed, the caps cut off the honey comb and the frames are put into a centrifuge to spin the honey out of them. The empty comb is replaced into the supers and they are stored until the coming season when they are put back onto the hives as the bees need more space to store honey. Productivity and convenience are maximized in Langstroth Hives. Local Eastern Ontario beekeepers use this system so the knowledge base and spare equipment in the area will suit Langstroth beekeeping. Diseases (the Foulbroods), pathogens (Nosema) and pests (Varroa, wax moths and mice) require extra management in Langstroth hives3. Top Bar Hives are not very well known but are gaining followers throughout the world. As it’s name implies the Top Bar Hive uses bars arranged side by side along the top of a box as the basis for it’s comb. There is no frame or wax foundation installed so the bees have more freedom to decide the size of the cells and the shape of the comb. 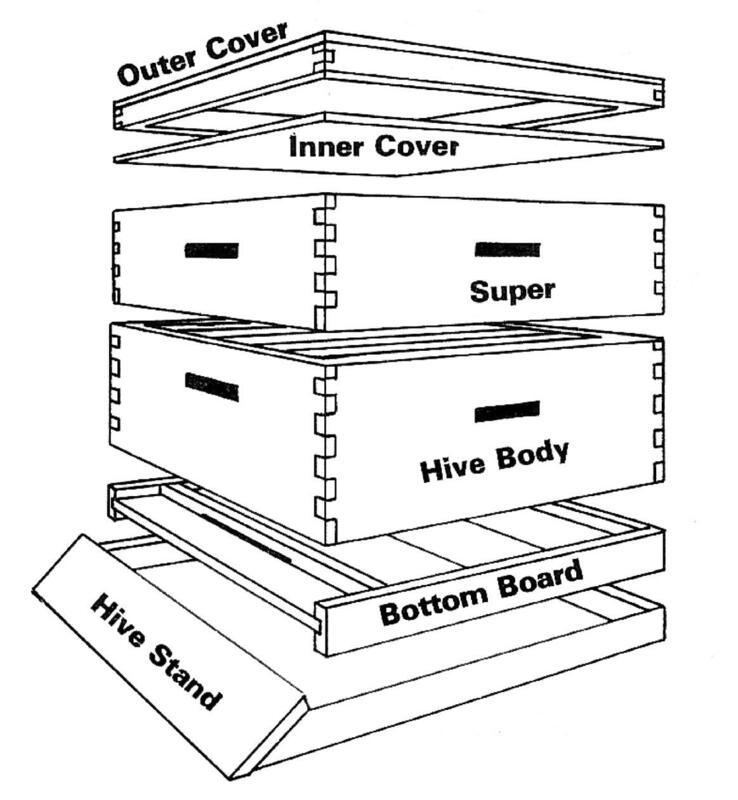 Instead of using the bottom-up approach of the Langstroth hive the Top Bar Hive use a sideways growth pattern. The bees make their own comb from scratch (no wax foundation) and it takes the rounded shape found in wild bee hives. At honey harvest the excess honey comb is removed from the hive and cut off of the bar either into a strainer (where it is crushed and drips into a pail) or into a container where it is frozen (to kill wax moth larvae) and sold as comb honey. Bee health and well-being are maximized in Top Bar Hives. Comb being removed and not returned to the hive (no old black comb) reduces some of disease, pathogen and pest pressures which leads to less chemical treatment to maintain the health of the hive4. The bees have to put more energy into building comb in the Top Bar hive than they would in a Langstroth so there will be less honey to harvest. The extraction methods are also slower and yield less (no wire frame in the comb to provide structural support for centrifugal honey extraction). There ‘s also the problem that there aren’t any local suppliers of Top Bar beekeeping equipment or local beekeepers with experience in this kind of beekeeping so I won’t have the same kind of support in the community should I encounter problems. This entry was posted on November 28, 2013 by beewhispers in Bee Equipment, Urban Beekeeping and tagged apis mellifera, Beehive, Beekeeping, bees, Honey bee, Langstroth Hive, Ottawa, Top Bar Hive.